Gim Deokyeoung primarily focuses on the various tools and relationships that stand between us, which are always lacking, which we use to talk, read, write, and read about situations, scenes, and emotions. It is a tool mainly used for the monophonic language and the mimic language to imitate the sounds and shapes, the musical score that directs the characteristics of the sound, the music that plays them, and the image that looks like a sign pointing to something with meaning. Each of these tools is like any other language and has its own structure and format, but none of them could fully capture the situation we desire most arduously. 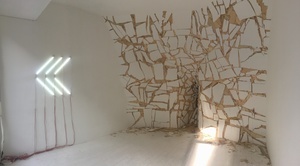 The artist is interested in the structure of these different tools and hopes to reveal the differences, cracks and gaps, that arise when a structure is transformed into another.